Vesuvius: a new custom in the making? In The Innocents Abroad, Mark Twain ridicules the miracle of San Gennaro (click here to read the entire excerpt) —that is, the miraculous liquefaction of the blood of San Gennaro— as "…one of the wretchedest of all the religious impostures one can find in Italy". One of the two days on which that miracle is believed to occur is coming up: the first Sunday in May. I don't pass judgment on miracles or others' belief in such. If I did, I would find a real job somewhere as a Miracle Judgment Passer or something. And here, also, they used to have a grand procession, of priests, citizens, soldiers, sailors, and the high dignitaries of the City Government, once a year, to shave the head of a made up Madonna — a stuffed and painted image, like a milliner’s dummy— whose hair miraculously grew and restored itself every twelve months. They still kept up this shaving procession as late as four or five years ago. That would make it about 1865. I have asked, and no one seems to know anything about it. Maybe they made up the story to feed his cynicism. Customs come and go, so I suppose it's quite possible that one really did exist and simply fell by the wayside. There is a strange custom among the people of Santa Lucia that is perhaps known to sailors but not to most Neapolitans. It is called "d' a 'Zegna" and is 'celebrated' on the day of St. Augustine (August 28). This barbaric and dangerous custom entails celebrants throwing anyone—especially innocent bystanders—into the sea who happens to be caught sitting on the seaside benches of Old and New Santa Lucia from dawn till nightfall on August 28. Last year, if memory serves us, this happened to a priest, a uniformed member of the armed forces, and quite a few street kids. This year, it was the turn of 14-year-old Vincenzo Di Grazia. At ten in the morning the poor child was sitting on a bench at Borgo Marinaro in New Santa Lucia when he was shoved into the sea by these roughnecks. He hit his head on the side of a boat and had to be dragged out of the water. He was taken to the Pellegrini hospital for treatment. I have been unable to find anyone who knows about this custom, It, too, has probably died out. Also, I don't know what it might have had to do with Augustine, one of the great theologians in the history of Christianity. Although —and this is just a guess— Augie happens to be the patron saint of brewers and sore eyes (among other things); so maybe you have a few pints too many, see some poor sap sitting on the bench and are inspired to walk over and say "Hi! Man, are you ever a sight for sore eyes!" and shove him into the sea. Beyond that, I wouldn't know. There are also recent customs that probably seem ancient to young children, but the origins of which are within living memory. Another entry mentions the "Wishing Tree," a Christmas tree set up in the center of the Galleria Umberto in December; you scrawl your wish for the coming year on a slip of paper and stick it on one of the branches. The custom of Christmas trees didn't find its way into this part of Italy until after WW2, so that would be an example of a recent custom. It is also an interesting example of combining something new, the tree, with something old, the votive slips of paper, which can show up at almost any religious shrine in Naples and even on some non-Christian statuary, such as the statue of the Nile God in the historic center of the city. As far as the photo (top) goes, this morning I noticed that someone is trying to invent a new custom. I was down at the Gambrinus Café off of Piazza Plebiscito, and I noticed a picture of Mt. Vesuvius on the wall. So far, nothing out of the ordinary. 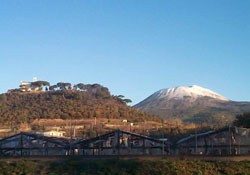 Below the picture, however, was a written invitation to "make your wish to Vesuvius" and to deposit the slip in the box provided on the table next to the picture. Making a wish to Vesuvius? That is unheard of, I believe, until invented by the proprietor of the café as some sort of a commercial gimmick. I have never heard of any custom that involves invoking the great god of the volcano (or some such Polynesia-like deity) in Naples. There is a monastery up there, yes —San Michele Arcangelo (in photo)— but as far as I know, they don't sacrifice goats or virgins, both of which are in distressingly short supply in the area, anyway. But maybe in a few years, making a wish to the volcano will be a custom. Like old proverbs, someone has to come up with these things. I wonder if there is an anthropological equivalent of Gresham's law in economics ("bad money drives out good money") that describes the relationship between new and old customs.